MAY 16, 2016, SWANSBORO, N.C. – Swansboro High School is home to a robotics club composed of students enticed by engineering. The club competes in annual tournaments where each team must build a robot capable of performing a designated task. 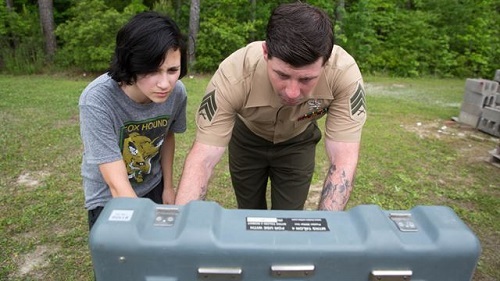 The Marines showed the students the capabilities of their robotics platforms in an effort to inspire them to create the best possible robots for their competitions and to expose them to the world of engineering. 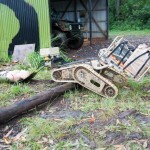 While robots are used for a multitude of tasks worldwide, EOD uses their robotic platforms, the Talon and the Pacbot, to battle against the tools of modern warfare, and, more specifically, improvised explosive devices. The robots allow the Marines to maintain a safe distance between themselves and any possible danger while disabling the threat. The students were able to operate the robots during the demonstration and attempted to grab hold of several object, such as golf balls, traffics cones and batteries, and place them in specific places. The hands-on application demonstrated the robots’ abilities and inspired the team to stick to their guns.